Do These Chemicals Cause Cancer? Ceramic cookware can mean several things: clay pots and pans that are baked in kilns then glazed. On the other hand, they can be made of aluminum, stainless steel, cast iron, and sheet metal, or other metals coated with ceramic enamel. Porcelain (enamel) is a nonstick cooking surface that does not scratch or chip and cooks evenly. They are preferred by cooks for being easy to clean and the even heat they provide. In the past, some glazes used lead in ceramics in the USA. Today we are concerned with perfluorooctanoic acid (PFOA), also known as C8 and perfluorooctanoate. These chemicals have been found in consumer goods and in some cookware. Polytetrafluoroethylene (PTFE), a component in Teflon®, has been around since the 1940s. It is a plastic that does not burn, is strong, tough, and waxy, and has been debated in recent years for its safety. DuPont™ makes Teflon®, in use since the 1960s and it contains PTFE. Teflon® is not believed to cause cancer. Conversely, PFOA can stay in the human body and the environment for an extended time. Studies indicate that it is in everyone’s blood at a low level in the USA. It has been found in some foods, household dust, and at low levels in drinking water. We are exposed to this nasty chemical in stain resistant carpeting, fabrics, and ski wax. Of course, we’ve been using it for years, (unless we use grandmother’s cast iron), in the highly proclaimed Teflon®, the non-stick cookware that is not supposed to be a significant source for chemical exposure. Most of us cooks do not want to be exposed to a questionable “significant source” at all. We want no part of it; PFOAs are toxic. Cast iron and copper react with acid foods and the metals can leach into the food. Cast iron does put iron into your food and that’s not a bad thing for people who do not have too much iron in their bodies or other medical conditions precluding iron ingestion. Iron will discolor certain foods and spinach will turn black. Copper can be toxic and anytime food is stirred in copper or cast iron, tiny flecks come off. Carbon steel is not toxic; however, it can also react to certain foods and discolor it. Stainless steel lasts for years, is safe, and will not break like glass. Stainless steel is a poor heat conductor. Thin stainless will cause foods to scorch and burn making it difficult to remove even with steel wool soap pads. In contrast, clay cookware is safe and tested to be 100% pure with no lead or cadmium (found in zinc ore, an extremely toxic metal). Using clay is a holistic, natural, and earthy way to cook. The best cookware since man left his cave dwelling! You care about where your food comes from, you care about genetically altered vegetables (GMO corn example), you care about hormone- and antibiotic-fed chickens, and now you care about what you cook the good food in. Budget—purchase the best ceramic cookware that your budget will allow. Cookware is an investment and will last for many years, so you want to be happy with what you buy. Material—this is the second most important consideration once you know what your budget will allow. The best ceramic cookware will give you exceptional uniform conduction with no hot spots, scorching, or food reactions to change color and taste. All cooks have their own methods in the kitchen from the gourmet connoisseur to the everyday great cook. Do you cook because you love to or because you must? Either way, you need the best ceramic cookware available. Some cooks use tin pans and consider that okay not understanding that better cookware keeps nutrients in the food with superb flavor, texture, and the cookware is attractive. How many pieces and size? Matching sets or contrasting pieces and colors? 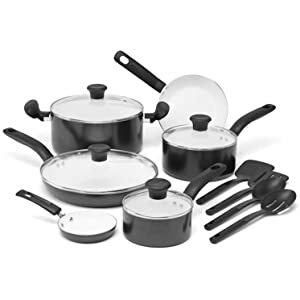 The best ceramic cookware sets can be used on electric, gas, glass, and ceramic stove tops. Be sure the bottoms are as flat as a pancake for using on ceramic and glass tops. Hint: if you have an induction cooktop, you will not be able to use ceramics and metals due to the magnetic energy generated from the stove. You will only be able to use cast iron, stainless steel, and anodized aluminum made specifically for induction stoves. There sure are limitations with this type stove. Be sure to purchase made in USA your best ceramic cookware. Foreign countries are not required to our rigid safety in manufacturing standards as we have in the USA. You will want to purchase 100% ceramic with a lead-free glaze. Do some research to be sure even the USA cookware states it is lead-free—no one wants lead leaching into their food. Buy from highly regarded companies that offer warranties. We hope we have provided you with information for an informed decision to purchase a wonderful ceramic cookware set. Happy shopping! The beautiful and functional WearEver® coating is PTFE-PFOA and cadmium-free. It is dishwasher safe and oven safe cookware. The model number C943SA is a 10-piece set in red. The lids are tempered glass. The C943SF is the gold/champagne color also a 15-piece set. WearEver® is located in Millville, New Jersey. The box the cookware comes in shows made in China. Does that mean the box was made in China or the cookware was made there? WearEver® states the cookware is engineered in the USA. It seems it’s up for interpretation. The WearEver® C944SA Pure Living Nonstick Ceramic Coating is a 10-piece set in gold and is PTFE/PFOA and cadmium-free, dishwasher safe cookware. 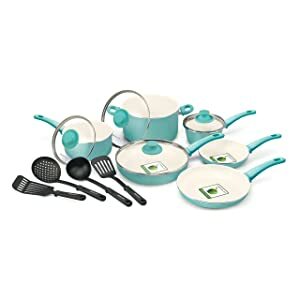 The WearEver® C944SA64 Pure Living Nonstick Ceramic Coating PTFE-PFOA-cadmium free dishwasher safe 10-piece cookware set comes in a champagne/gold color. It has a bigger skillet for frying chicken. 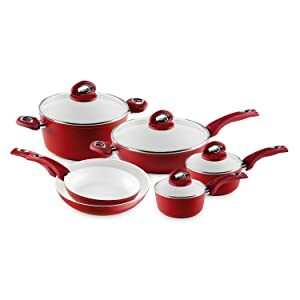 The 10-piece ceramic interior provides superior high heat performance providing scratch resistance and includes an 8-inch sauté pan, a 10-inch sauté pan, a 3-quart saucepan with lid, a 3.5-quart skillet with lid, a large 5-quart Dutch oven with lid, and 2 cooking utensils. All WearEver® sets come with instructions, a User’s Manual, and a Limited Lifetime Warranty. The cookware set is made in China. Be the first to write a review on Amazon.com® for this model number. The ceramic is over an aluminum body about 1/8-inch thick for greater heat conductivity with no ‘hot spots’. It is sturdy and durable although heavy but not lightweight with the ceramic coating inside. The outside color coating is not “paint” it is enamel, a great product. The cookware is not to be used in the oven. Turmeric, paprika, curry spice, and other dark colored spices will not tarnish the white ceramic coating. Do not use on an induction stove. Works well on ceramic and glass topped stoves, gas, and electric. The spiral bottoms of the cookware are aluminum and can scratch glass-topped stoves with the grooves. So, do not slide or twist and turn them to move; pick up and sit down when moving. Only use plastic or wood utensils to avoid scratching the interior ceramic that is white. These pots and pans do better when washed by hand. They clean so easily that a dishwasher might be too harsh with the super-hot water and strong detergents. “Items must be returned within 30 days. Gift-wrap is available so why not give to someone and yourself. These are affordable at Amazon.com®. The cookware set is made in China. 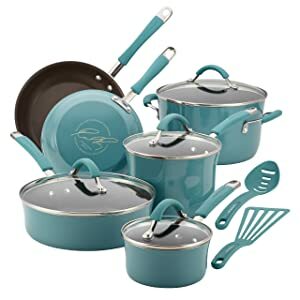 The Rachael Ray™ line of porcelain enamel cookware comes in beautiful harmonizing or contrasting colors of blue, red, green, orange, purple, agave blue, and fennel in 10, 12, and 14 pieces. The highly efficient and durable nonstick cookware is a must-have for creating delicious meals. The two-tone gradient color makes a confident statement in your kitchen décor. 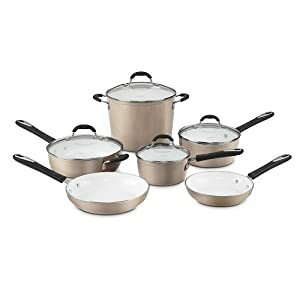 This set includes a 1- and 2-quart covered saucepan, 6-quart covered stockpot, 3-quart covered sauté pan, an 8-1/2-inch and 10-inch skillet. A slotted spoon and turner are included. They are PTFE-PFOA-cadmium and lead-free and are sturdy with its long-lasting hard enamel porcelain exterior and an aluminum core for strength and weight. The rubber coated stainless steel handles are dual riveted to the body. The lids are made of tempered glass to seal in moisture and heat. There will be no heat spots that can burn food with its even heating. The cookware is oven safe to 350 degrees F. and safe for all cooktops exception induction. Note: The cookware must be hand washed. Is not dishwasher safe; the porcelain finish will be lost. Besides, they are a snap to clean. No scrubbing and the food falls off with a soft sponge or dishcloth. Do not use abrasives or metal utensils. Gift-wrapping is available and the set comes with instructions, a User’s Manual, and a Limited Lifetime Warranty. Rachael Ray™ is a registered trademark of Ray Marks Company LLC. The cookware set is made in China. The beautiful ergonomic GreenLife™ ceramic cookware with Thermolon™ ceramic non-stick coating makes cooking easy and it is an excellent heat conductor and is non-toxic. The core and body is aluminum and the interior cooking surface is ceramic making it a hassle-free clean up. The GreenLife™ ceramic cookware contains no PFOA, lead or cadmium. 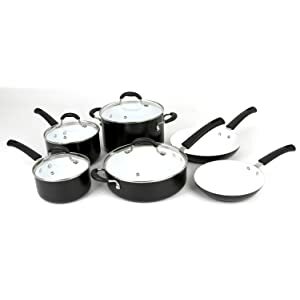 The 12-or 14-piece set is available in black cream, burgundy, and turquoise and includes a 7-inch open frypan, 9.5-inch open frypan, 1-quart covered saucepan, 2-quart covered saucepan, 5-quart covered casserole, 2.5-quart covered sauté pan, and 4 nylon utensils. The lightweight cookware provides great heat distribution with no hot spots for burning and scorching. Bakelite handles are smooth, fit your hands, and are cool to the touch. This wonderful cookware lets you braise, roast, crispy frying, and create sauces. Heat is perfectly distributed for uniform cooking. Cook on low to medium temperatures, and you will be rewarded with delicious meals. If you do overheat, there will be no toxic fumes as with Teflon®. The Thermolon™ white ceramic coating distributes heat more efficiently so that protein foods cook more quickly. Use on all stove tops but not on induction stoves. These can be put in the oven up to 250-degrees F., and are safe to put in the dishwasher. Do not use metal utensils because they will scratch the inner surface. Use plastic, hard rubber, or wood, including tongs. Never cut food in the pan, and never leave an empty pan on a hot burner. The manufacturer recommends never using aerosol oil sprays, such as Pam. The additives in them cause the oil to burn even at low temperatures! The oil heats up more easily, creates carbonization (burning), and can affect the performance of the non-stick surface. Because the surface is non-stick, you do not need oils anyway. If you do need to use oils, butter is preferred, refined olive oil, corn oil, peanut oil, but never use extra virgin olive oil because it burns quickly. Gift-wrapping is available for your family and friends and the price is very affordable. The set comes with instructions, a User’s Manual, and a Limited Lifetime Warranty. The cookware set is made in China. T-fal® invented non-stick cookware in 1954—a good thing for cooks—providing groundbreaking healthy cookware. They are a leader with their non-stick cookware globally. The PTFE-free, PFOA-free and cadmium-free cookware is eco-friendly having no toxic fumes. 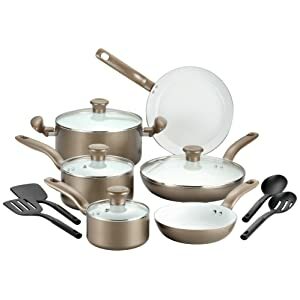 The T-fal® gold color model number C728SE Initiatives Ceramic Nonstick Cookware comes in a 14-piece set to harmonize with your kitchen décor. The black color model number C921SE will look beautiful with your black appliances and also has 14 pieces. The set is safe for all cooking methods except for induction stoves. The cooking surface is able to reach 700-degrees F. and is oven safe up to 350-degree F. Included in the set is an 8-inch frypan, 11-inch frypan with lid, 1-quart saucepan with lid, 2-quart saucepan with lid, 5-quart stewpot with lid, one egg wonder (see instructions for use), Dutch oven, and 4 nylon tools. The set is stain and scratch resistant. The manufacturer states that this cookware is suitable for all types of cooking utensils. The cookware provides an easy-to-clean product that is dishwasher and oven safe. The bottom provides even heat with no hot spots. You can cook healthier by not using oils or using less of them. With its durable heavy-gauge aluminum core, heat is distributed evenly. You can see through the tempered glass lids to monitor your cooking. Gift-wrapping is available and the set comes with instructions, a User’s Manual, and a Limited Lifetime Warranty. The cookware set is made in China. Cuisinart® started making professional cookware 35 years ago, motivated by the French. The great French kitchens used classic cooking techniques that stimulated the cookware available today. This Cuisinart® model number GG-12 GreenGourmet cookware has a base of hard anodized aluminum that is eco-friendly for being “green.” It is free of PTFE, PFOA and cadmium so is non-toxic in a black color. Accolades and credit is due Cuisinart® for using 100% recycled materials using biodegradable soy ink for its printing. 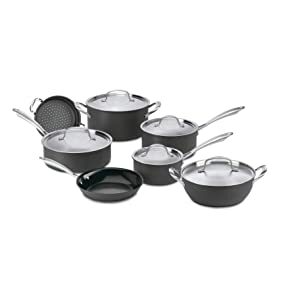 The 12-piece set has an 8-inch open skillet, 10-inch lidded deep fry skillet, 1-1/2-and, 2-1/2-quart lidded saucepans, 3-quart lidded everyday pan, 6-quart lidded Dutch oven, and steamer insert. The ceramic non-stick surface will not peel off, has superb heat conduction, and is oven and broiler safe. The handles are riveted to the pan made of 70% recycled stainless steel having the ability to go into the oven. The ceramic is petroleum-free being water-based. The set is safe to use in the oven up to 500-degrees F. and under the broiler sitting on a lower rather than the top shelf height. Hand washing with a mild detergent is recommended for these pans to maintain the beauty. Use a soft dishcloth or sponge—without the scratcher surface and they will last for many years. Imported cookware, especially from China, can pose issues since China inclines to ignore USA safety regulations. The Ceramica© used by Cuisinart is manufactured in Italy to conform to all USA and EU (European Union) (RoHS) Restriction of the Use of Certain Hazardous Substances safety codes and standards. The set comes with instructions, a User’s Manual, and a Limited Lifetime Warranty. 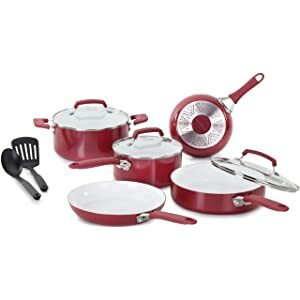 Another great Cuisinart cookware set is the 10-piece set model number 59-10CH that is functional and gorgeous for your kitchen in champagne pink color to harmonize with your décor. Porcelain and ceramic cookware have no PTFE (polytetrafluoroethylene) used in Teflon® made by DuPont™ for healthier eating. The ceramic interior does not require oil or butter and the food will simply slide out. The interior resists scratching but it is best to not use metal utensils. The cookware is safe to put into the over up to 350-degrees F., but not hotter. The handles stay cool and are riveted onto the bottom rather than using screws. Being straight, the handles are easy to grip and stay cool. Use a small amount of butter or oil to season the set and never use Pam or cooking sprays that are hard to remove. The core is made of heavy-gauge aluminum for great heat conduction and is durable for years to come. The tempered glass lids have a hole for steam and fits tightly to seal assuring you of keeping the nutrients and flavor right where they belong in the food for your family. The cookware can be used on gas, electric, glass and induction stoves.The manufacturer recommends to wash and dry by hand and not put in the dishwasher. The food wipes off so easily you’ll be done in no time. 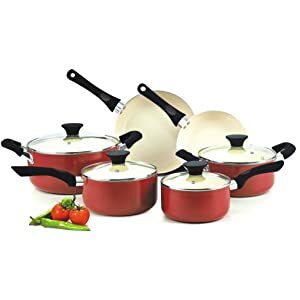 The 10-piece set includes a 1-1/2-quart saucepan with lid, a 2-1/2-quart saucepan with lid a 3-quart sauté pan with helper handle in front to lift and carry with its own lid; an 8-quart stock pot with lid for those delicious chilies and soups, and an 8-inch and 10-inch skillet. The lids are interchangeable with the pots of the same size diameter. The set weighs about 10 pounds. Bialetti® is a world leader having started in Italy many years ago. Their cookware is beautiful, functional, and simple to use. Bialetti® is a genuine Italian product used in 90% of the homes in Italy. The white ceramic, non-stick, ecofriendly set with tempered glass lids are a perfect fit for your great cooking experience. The set is free of PFOA, PTFE, and cadmium. 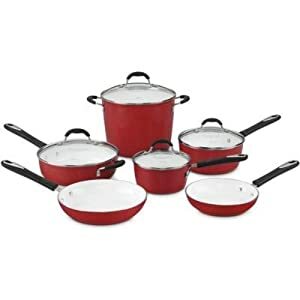 The 10-piece Bialetti® Aeternum Red 7272 10 Piece Cookware Set comprises an 8-inch sauté pan, 10.25-inch (2-quart) sauté pan, 12-inch (2.5-quart) sauté pan, 10-inch deep sauté pan, a saucepan, a square griddle for sandwiches and pancakes, an 11-inch stir-fry, 5-quart Dutch oven, and a 10- and 12-inch lid interchangeable with the pots. The non-stick ceramic interior is a 3.3 mm (0.118-inches) gauge composition. The aluminized steel core construction provides greater heat distribution and has high-temperature exterior finish, using low-to medium-heat. The extra-long handles are soft and will fit your hands comfortably. These pans are suitable to go directly to your table. The ceramic coating will never be absorbed by your food. Use nylon, wood, high-temp silicone, and rubberized utensils and tongs for cooking. Metal will scratch and ruin the interior surface. Never use knives to cut foods in your pans. Gift-wrapping is available and the set comes with instructions, a User’s Manual, and a Limited Lifetime Warranty. The cookware is made in China. The Calphalon® Kitchen Essentials Collection is a gorgeous shiny black outside surface with a white interior ceramic for easy cooking and cleanup. The pots and pans heat up evenly and will never stick. With the silicone handles, your hands stay cool on the lid handles as well. The set is PFOA-free, cadmium and lead-free for your good health. The base is made of heavy-duty aluminum and the set is oven safe to 400-degrees F. but not safe under the broiler. Hand washing is recommended by the manufacturer.Use a tad of butter or oil to season the set and never use Pam or cooking sprays that are hard to remove. 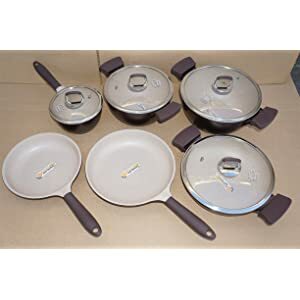 The set consists of an 8-inch frypan, 10-inch frypan, 1-quart saucepan with lid, 2-quart saucepan with lid, 3-quart saucepan with lid, 3-quart sauté pan with lid, and a 5-quart Dutch oven with lid. The set weighs about 7 pounds. The cookware can be used on electric, gas, halogen and glass stovetops but not induction. It’s always best to use wood, nylon, or hard rubber utensils with ceramic coatings. You will receive a User’s Manual and a 5-year Lifetime Warranty. The set is made in China. 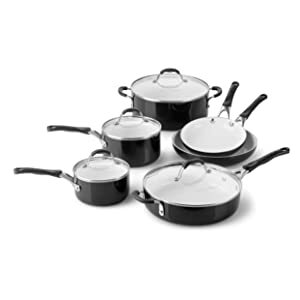 The Oneida® ceramic cookware set is made of heavy-gauge aluminum for no hotspots, with even and consistent heating. The set is PFOA- and PTFE-free. The tempered glass lids let you see what’s cooking while maintaining the moisture of the food. Hand washing is recommended but the instructions state they are dishwasher safe. You can use these handsome pots and pans on gas, electric, glass and induction stovetops. With the iron center, they work perfectly for induction. The best utensils are wood, hard rubber, and plastic. These are for the stovetop only and cannot be used in the oven. Medium heat is best to keep your investment beautiful and functional for many years. The handles are riveted and easy to grip. Use a tad of butter or oil to season the set and never use Pam or cooking sprays that are hard to remove. Your 10-piece set will have a 1.5-quart covered saucepan, 2.5-quart covered saucepan, 3-quart covered sauté pan, 8-inch diameter frying pan, a 10-inch in diameter frying pan, and a 5-quart covered stockpot. The set weighs about 10 pounds. Gift-wrapping is available for loved ones and friends. You will receive a User’s Manual and a 10-year Warranty. The set it made in China. 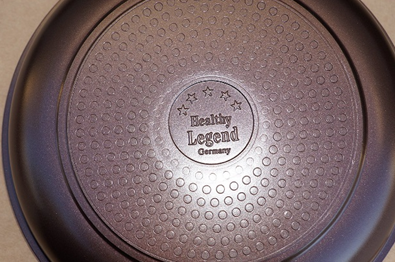 The Healthy Legend brand of cookware is German made and has no toxins. The German Weilburger Greblon® ceramic interior coating makes food slide easily and clean up quickly. The set can be used on induction cooktops and put in the dishwasher. The Weilburger third generation ceramic coating is 10 times more durable than Teflon® without the toxins. The interior color is gray and Teflon® is black to note the difference. The base of the cookware is pressure cast aluminum for even heating and constancy in cooking never warping. You can put the cookware in your oven up to 450-degrees F. The tempered glass lids are vented for steam to escape and are heavy. The handles are made of phenolic resins and not attached using rivets. Use a tad of butter or oil to season the set and never us Pam or cooking sprays that are hard to remove. It is safe for your pet birds have no toxic chemicals and no PFOA no PTFE or other harmful chemicals. The Germans are very knowledgeable in the concerns we all have for our health and cancer causing chemicals. Note on the bottom of the cookware ‘Healthy Legend—Germany.’ That is impressive for a great product. Your set will have 6 pots and pans with 4 lids. The frypan is 9.6-inches, another is 11.2-inches, a sauté pan that is 11.2-inches, a 1.9-quart saucepan, and a 4.5-quart medium soup pot with a 6.5-quart large soup pot. The set weighs about 10 pounds. You will receive a User’s Manual and a 1-year Lifetime Warranty. The set is made in Germany. Ceramics are made of minerals in clay by heating and hardening. Porcelain is made from clay as well; however, at a higher temperature than ceramic. Porcelain is translucent (transparent) and ceramic is opaque (not clear). Porcelain seems to be more delicate in appearance compared to ceramics. Porcelain has a smooth and fine surface and is thinner and whiter than ceramics. Ceramic pots and pans made from ceramic are very versatile and widely available online today. They can endure heat and can be stored in the refrigerator and freezer. They can be used in the microwave where metal cannot. They are the least reactive, are lovely on the dining table, and require no scrubbing with abrasives. When maintained as each manufacturer recommends, they will be shiny, functional, and beautiful for years. Use about 1 tablespoon of bleach in 8 ounces of water and simmer for 10-15 minutes. Allow to cool and remove the stain with a soft sponge or dishcloth. Wash in warm soapy water, rinse, and towel dry. Season again with a little oil, wash, rinse, and dry. Misuse can void the manufacturer’s warranty. Minor marks and discolorations develop over time from use, but should not alter the performance of your cookware. It’s best to not use sharp edges, or sharp forks with this cookware. If you purchase cookware that says it is safe to use with metal utensils, you will probably be okay. However, do not use sharp knives or other utensils to cut things in the cookware. It is recommended not to use electric hand mixers or rotary beaters in the cookware. If your product has wood knobs on the lid or wood handles, do not put in the oven. The wood will burn and turn black. Wood does not do well in the dishwasher either. The black or colored handles are made of phenolic (plastic/resin) over steel or rubber gripper handles that are oven safe up to 350-degrees F. Make sure your oven is preheated to 350-degrees F. before putting the cookware in. Ovens that preheat use a higher temperature to get to your baking temperature quickly. Do not use these handles under a broiler. The tempered glass will not break (with common-sense use). Heavy-duty impacts can cause chipping. You will never want to put your glass lid directly over the stove’s heating element. Use no cleaning pads, sharp knives or anything that can weaken the glass. Do not use these items on the cookware as well. Keep away from sudden temperature changes. You should never put a hot pot or pan into the refrigerator or freezer; let them cool to room temperature first. The best ceramic cookware is a quality and inexpensive way to cook. Turn your kitchen into a place of beauty and function with any of the 10 best ceramic cookware sets listed here. We hope our suggestions and comments have helped you with your buying decision. Read reviews and see what others are saying. We have enjoyed our successful reputation from satisfied customers. Our customers are highly respected and our professional team remains conscientious in its mission for focusing on every customer’s request and preferences. Feel welcome to contact us with your questions or ideas. We sincerely value your feedback. We hope we have provided you with information for an informed decision to purchase a wonderful best ceramic cookware set. Happy shopping! Which is better the hard porcelain or the ceramic. I’m comparing the Rachel Ray set vs. the Greenlife set. Both the GreenLife™ ceramic cookware with ceramic non-stick coating and the Rachael Ray™ porcelain enamel cookware are excellent choices. Personally, I like porcelain, and I use both in my kitchen with excellent results. The cooks in your kitchen will love either brand. Thanks for your nice compliments and come back often to see new products. I’ve read in several places online that Greblon is not PTFE free because it’s the trademark name for Teflon in Germany. Greblon® states at their website and in the USA that their coating is indeed PTFE free. PTFE is not a trade mark; it’s a chemical component in Teflon® formerly made by DuPont® and no longer being made. They never say what is on the bottom outside of the pan. And I have read that painted bottoms are a no, no on glass top stoves. So how do you find that info.? There is never any paint used on any cookware! OMG! Paint would melt and make a huge mess! No manufacturer paints cookware! The bottom is the same material used for the pan such as stainless steel. If you buy copper bottom pans, they will have a copper bottom to put on the glass top stove. All the pots/pans/skillets reviewed here will tell you if they can be used on a glass top or not. Hope this helps you. We just purchased the Bialetti Aeternum 12″ ceramic fry pan. It states it’s made in China not Italy. Should we be concerned with the quality and safety of this product since it isn’t made in USA? They are not made in Italy, and yes, they are great cookware made in China having excellent quality. It’s good that you’ve covered the ins and outs of ceramic cookware as you have. It’s one of the healthiest types of cookware on the market and well-worth considering. Information like this helps in making an informed decision. Thanks for the great positive feedback and support! Yes, ceramic is the best and I love the cookware myself. Your article was excellent reading! I am in need of a new cookware set and have had Teflon® for years. It’s time for a cleaner, healthier way of cooking. I considered visions glass pots and pans, but read a few things that I did not like. Do you have any thoughts on glass? I am looking at the Gerblon glass cookware. Are there any additional thoughts you can offer? I have not reviewed any glass cookware. I am not familiar with the correct spelling “Greblon®” brand. The Visons® and Pyrex® brands are good for glass. However, I find the ceramic and porcelain ones to be the best that you can read about here. Greblon® makes non-stick cookware and ceramic but not glass. We will review and post glass cookware soon. I have used Corning® Visons glass cookware and loved it; except I broke most of it on my kitchen sink! I replaced it eventually with porcelain. I am not familiar with Greblon®. Anchor Hocking® is good for baking as well as Pyrex®. Go to this link on Amazon and read customer reviews about the glass cookware. The one you want, spelled “Greblon” is not sold on Amazon.com and we are Amazon Affiliates. I checked their website and they do not sell glass. It looks like a coating similar to Teflon® on their skillets. Check out their site here. I did reply to you on March 16, 2018 on this page. I recently purchased a Bliss Hydro Ceramic non-stick ceramic fry pan (Ecolution/Epoca). It says it is PFOA and PTFE and Lead free. However, it is made in China. Do you know how trustworthy these claims would be since it is made in China? China must comply with USA standards so it is what it says it is. Almost everything is made in China these days using regulations by the company hiring them to make the products. The manufacturer recommends never use the oil heats up more easilying aerosol oil sprays, such as Pam. The additives in them cause the oil to burn even at low temperatures! The oil heats up more easily, creates carbonization (burning), and can affect the performance of the non-stick surface. Because the surface is non-stick, you do not need oils anyway. If you do need to use oils, butter is preferred, refined olive oil, corn oil, peanut oil, but never use extra virgin olive oil because it burns quickly. I wrote this. What’s the problem? The statements are true and the first sentence had some mistakes that are now fixed that should read: ‘The manufacturer recommends never using aerosol oil sprays, such as Pam. The additives in them cause the oil to burn even at low temperatures!’ The balance of the paragraph is correct along with the gift-wrapping and Warranty ending paragraph. So hope that settles the issue for you. The misspelled word you used, “easilying” was not spelled that way by me. The word is: easily. Therefore, I hope that settles the issue for you. Great article! I want a pure ceramic frying pan . Can you recommend me the brands for pure ceramic cookware? Thanks! All of the ceramic cookware sets listed on this page are excellent. If you want only skillets, read this page. Hope this helps you with your selection. LOVE your article! Explained so many things that I didn’t know to ask! What is your all time favorite brand to use? Would love to know! My favorite is Calphalon® Kitchen Essentials Collection. You will like it too. Huge thank you!!! I was driving myself crazy trying to figure it out! You said not to buy any cooking products that are manufactured in China. The reason is goods manufactured in China tend not to honor USA standards. But all of your ceramic cookware sets except the German one are all manufactured in China. Now I realize it is very difficult to avoid Chinese made goods for this very reason. So are there any ceramic cookware sets that are made in the good ol’ USA? Yes, I did say that; however, it’s hard to find cookware not made in China, Thailand, Korea, and other Asian countries these days by USA companies. Some are made in Mexico. 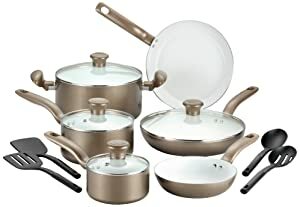 Here is a great stainless-steel set made in the USA sold on Amazon.com®. Porcelain enamel is superb too. Cookware made in Germany and Italy are fine choices as well. This is an excellent German made skillet. American Cookware is a USA made stainless-steel and ceramic skillet manufacturer that I like. Browse their products at the link, click the one you like, and Amazon will ship to you for Christmas. Check these sites out and let me know. I love your article and it’s very informative. I want to refer to the section “Ceramic Cookware vs Metal and Others.” You mentioned clay cookware to be safe and tested to be 100% pure with no lead or cadmium and using clay is a holistic, natural, and earthy way to cook… Does this make clay better than the ceramic cookware? And I recently found some clay cookware in my grandma’s kitchen but they are in their natural brown unattractive form. 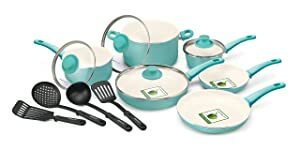 Is there a way to make them attractive or more colorful like the ceramic cookware? What kind of paint or spray can be used to make them more attractive please? Thanks for loving the articles here. Clay cookware is made from the earth. Ceramic is usually porcelain. Both are good. I prefer clay because it’s so earthy. I don’t know of ways to refinish/refurbish your grandma’s old clay cookware. I definitely would not use paint for cooking in. You can research on the Internet or take to a potter to glaze and re-fire in a kiln. Or, use the cookware as your grandma did—natural. There’s a charm in that! Thanks for the in-depth article. Very informative and lots of options. I was curious to know if you had any thoughts on the Xtrema brand. It’s ceramic. Not sure where it’s made. Thanks. Xtrema® cookware is entirely ceramic. Read more about it at their website. If you’d like me to write a review, please let me know.